The fourth grade students of Miller Place School District’s Laddie A. Decker Sound Beach School recently took an educational field trip to the Miller Place–Mt. Sinai Historical Society and participated in a walking tour of several historical sites in Miller Place. 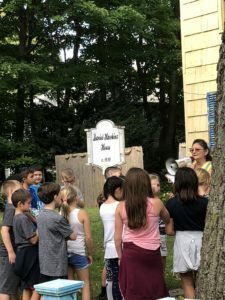 The walking tour coincides with the fourth grade social studies curriculum offered in the District as the students study the early settlers of Long Island and New York. Students attentively listened to members of the Historical Society discuss the lifestyle for residents of Miller Place in the 17th century while they were led on a walking tour of two historical properties. Along the tour, students eagerly discovered William Miller’s house that was built in 1720, and the Daniel Hawkins house that was constructed in 1810. 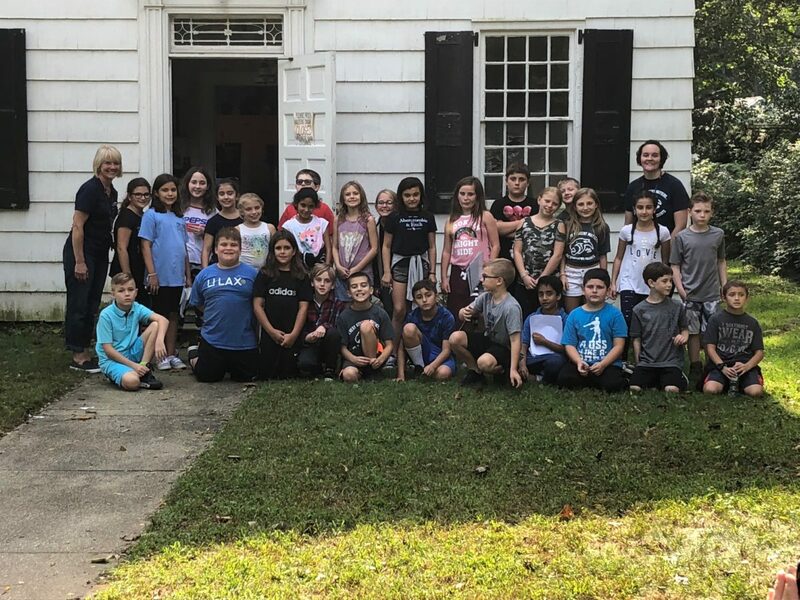 As the students explored the houses that are now maintained as museums, the Historical Society tour guides presented the history behind the initial settlement of Miller Place and the history of the two houses. The Miller Place–Mt. Sinai Historical Society was founded in 1974 as an initiative to preserve the history in the Miller Place-Mount Sinai communities of Long Island. The Historical Society supervises two properties including the William Miller House and the Daniel Hawkins House. 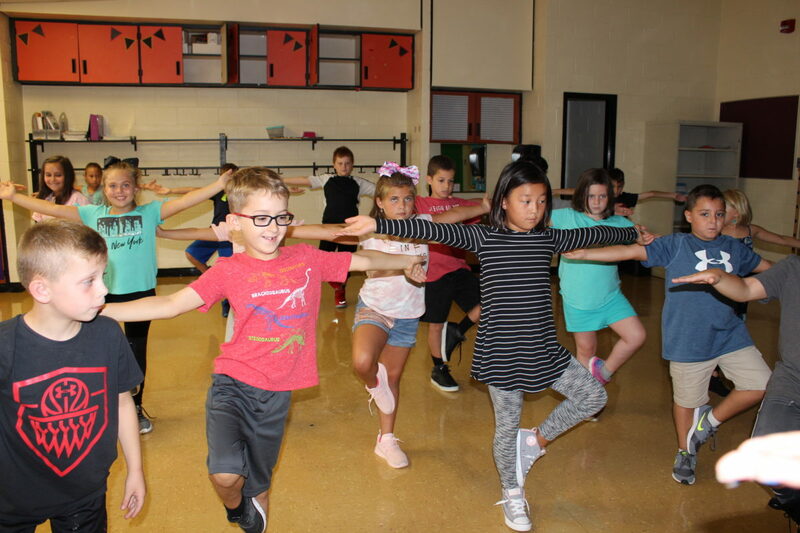 The Miller Place School District’s Laddie A. Decker Sound Beach School recently added a new yoga program for the 2018-2019 school year. The program focuses on enriching students’ physical and emotional education through a series of yoga classes. Students in grades three through five will be taught the importance of mindfulness and body awareness by practicing different yoga poses and relaxation and breathing techniques. The 30-minute classes are designed to encourage students’ self-discovery and help develop increased confidence. Teachers at Laddie A. Decker Sound Beach School are excited to introduce students to new solutions to clear their minds, enhance their ability to focus and gain a more positive outlook on themselves and others. For more information about the Miller Place School District, please visit the District’s website: www.millerplace.k12.ny.us. 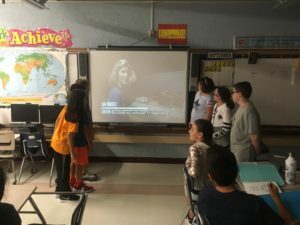 Several teachers at Miller Place School District’s North Country Road Middle School took the initiative to honor our country’s 9/11 fallen heroes by educating students about the horrific attacks that took place 17 years ago. 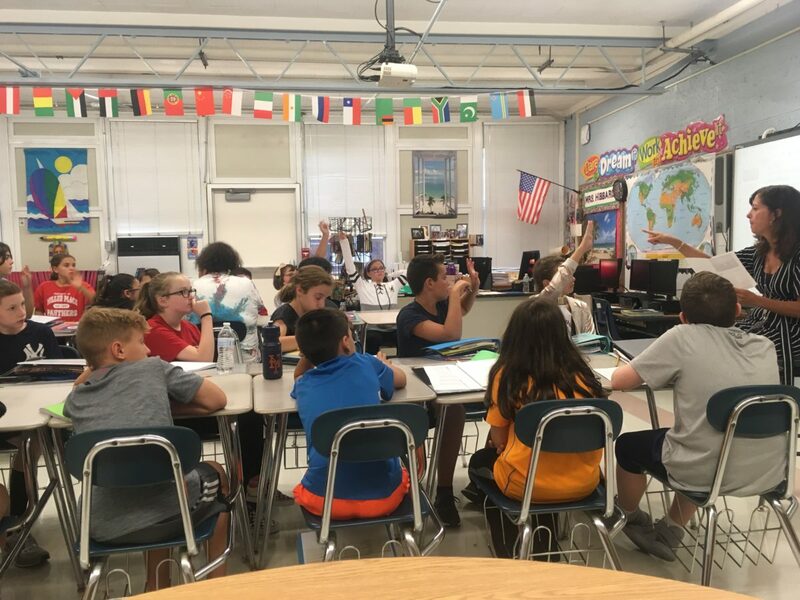 Mrs. Himmelmann and Mrs. Saulle, two 7th grade English teachers, held lessons that included having students listen to recorded interviews from the 9/11 Memorial Museum’s oral history collection. The videos captured the different perspectives and emotions of three individuals who experienced the 9/11 attacks first hand. Students then reflected on each person’s perspective and touched upon what they found most shocking or moving in each person’s story. To complete the lesson, students remembered a positive or negative memory from their past to write about and share with their teacher. Mrs. Hibbard, a 6th grade social studies teacher, used a lesson on artifacts to educate students on the 9/11 attacks. The lesson taught students about the significance of artifacts and how they provide us insight into our past. Mrs. Hibbard also shared a video about 9/11 which showed students real-life artifacts, including artifacts recovered from Ground Zero. The Miller Place School District is proud to announce the recognition of its high school’s athletic program by the New York State Public High School Athletic Association (NYSPHSAA) as a School of Distinction in the Scholar-Athlete Team category for the 2017-2018 school year. Miller Place High School is one of only 30 public schools from the 750 in New York State to earn this distinction and be placed on the 2017-2018 NYSPHAA Academic Honor Roll. The Miller Place High School Athletic Program has earned different levels of Scholar-Athlete recognition by the NYSPHSAA over the last few years. During the 2015-2016 school year, MPHS’ athletic program received the School of Distinction Award, and in the 2016-2017 school year, the high school’s athletic program earned the School of Excellence award. In order be recognized as a scholar-athlete team by the NYSPHSAA Scholar Athlete Program, 75 percent of team rosters must maintain a cumulative Grade Point Average (GPA) of 90.00 or higher. To qualify as a School of Distinction, each team in the District’s varsity program must earn Scholar-Athlete Team status for the duration of the school year. Districts recognized by the NYSPHSAA as Schools of Excellence must have 75 percent of their varsity teams earn the Scholar Athlete status. For more information about the Miller Place School District and upcoming events, please visit the District website at www.millerplace.k12.ny.us. Students at Miller Place School District’s North Country Middle School learning about artifacts recovered from the 9/11 site. Mrs. Hibbard, a sixth grade social studies teacher, dedicated a history lesson to educate students on the 17th anniversary of September 11th. The Miller Place School District ardently opened its doors on September 4th to begin the 2018-2019 school year. After spending the summer months adding new technologies and developing new systems to enhance students’ educational experience, each school organized activities to celebrate the excitement of the first day back to school. 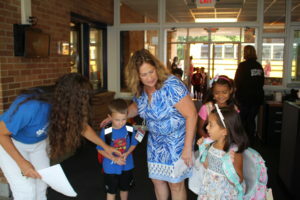 At Andrew Muller Primary School, Dr. Cartisano and Board of Education President Johanna Testa helped students in kindergarten through second grade ease the transition from summer recess to a new school year. Students were able to easily navigate the hallways and locate their classrooms with the assistance of the building’s faculty and members of central administration. 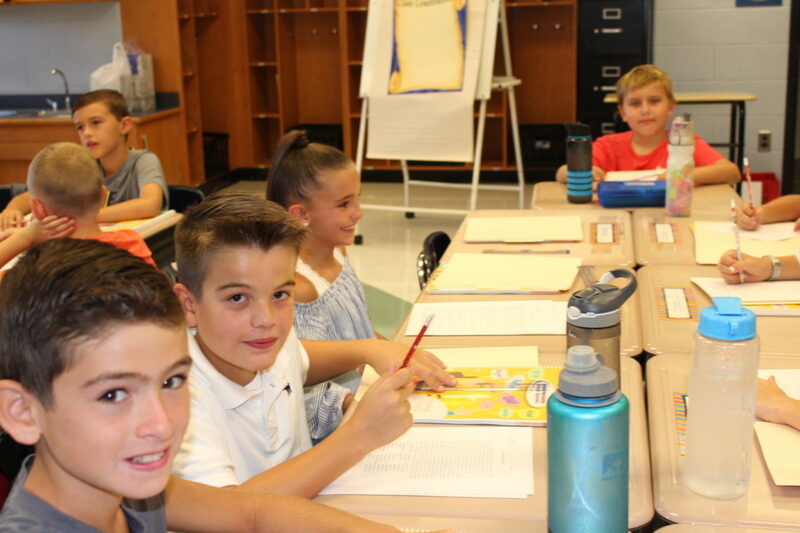 At Laddie A. Decker Sound Beach School, fifth graders started the year off strong by working collectively with their classmates on “Back to School” word search puzzles. The students challenged themselves by searching for new vocabulary words in both a creative and educational manner. 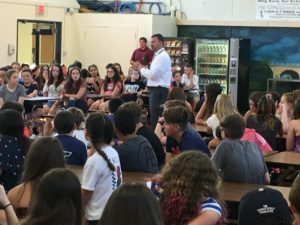 At North Country Road Middle School, Principal Matthew Clark held an assembly in the cafeteria for eighth grade students on their responsibilities as new leaders in the school. Principal Clark discussed the significance of being role models as the oldest students in the building and the expectations for this school year. 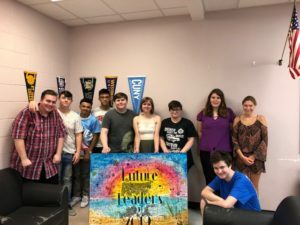 At Miller Place High School, the seniors eagerly explored the senior lounge for the first time, a room exclusively offered to the standing senior class. The upperclassmen have the privilege to utilize the senior lounge for communal learning, enjoy lunch in a quiet space or to bond with peers. Superintendent of Schools, Dr. Marianne Cartisano and Board of Education President Johanna Testa, along with other central administration gathering at Andrew Muller Primary School as the students arrive by bus to assist the K-2 students navigate the hallways and locate their classrooms. North Country Road Middle School Principal Matthew Clark addressing the new eighth graders on their first day of school about the expectations for this year as the new leaders of the school. Miller Place High School seniors reconnecting with friends in the senior lounge, a room exclusively offered to the members of the senior class. The Miller Place Union Free School District announced today that it has officially completed the installation of its Districtwide solar energy system, which will be fully online for the 2018-2019 school year. The new clean energy program will provide the District with significant savings on energy costs and establish the Miller Place School District as one of the most eco-friendly school districts on Long Island. Each school building throughout the District has been outfitted with state-of-the-art solar panels, providing the District with approximately 1.3 megawatts of clean, solar energy. The initiative was part of the District’s ongoing energy conservation plan, which was announced as part of an energy performance contract that was approved by the Miller Place Board of Education in 2014. The clean energy system is anticipated to save the District more than $240,000 per year in energy costs, and over $3.6 million over the course of 18 years. This projected cost saving will enable the District to reallocate funds to other expenses and capital improvements without the need to increase the District’s overall operating budget. To quantify the energy and cost savings the District has installed monitors in the front lobby of each building that will show the amount of energy the solar panels are producing at any given time. In addition to depicting the number of kilowatt-hours the individual building’s solar energy system has generated, the monitors will also inform students, teachers and parents of the solar energy system’s environmental benefits—including the amount of electricity that was no longer needed to power the building and the decrease in the amount of carbon monoxide that was no longer emitted into the environment.